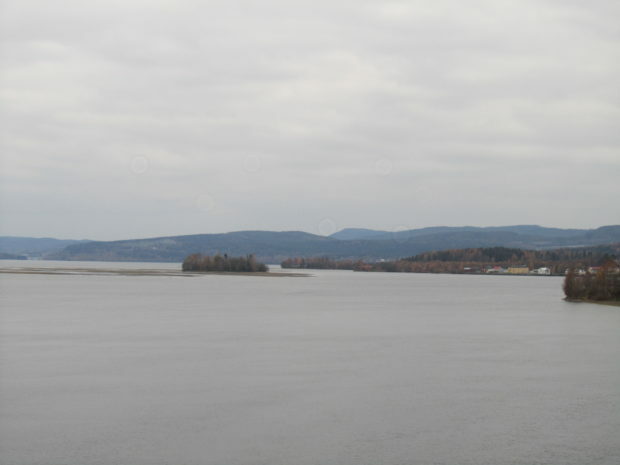 One of the sites in the ongoing study of ballast is the small island Little Norway (Sw. Lilla Norge) in the river Ångermanälven in the northern part of Sweden. The island got its somewhat peculiar name from the many Norwegian ships that dumped their ballast at a certain point in the river. During the second half of the 19th century Norwegian ships played a dominant role in the export from the Swedish woodworking industry. The island Little Norway surrounded by sand reefs, to the right is the port of Nyland. Photo: Mats Burström. Little Norway is situated in a shallow part of the river between the villages Nyland and Sandslån that lie on each side of the river. Nyland used to be an important port for the woodworking industry. Before the ships went to the dock to load their cargo they dumped their ballast in the river where it started to form a small island. 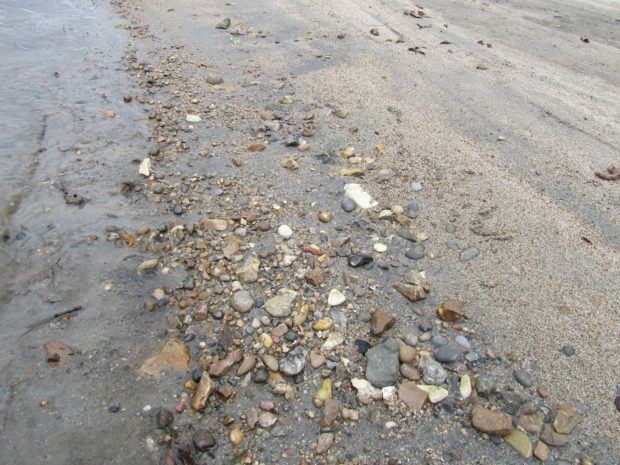 The island gradually grew in size, not only because of the increasing amount of ballast dumped there but also because of large quantities of sand brought there by the water flow. Ballast flint on the shore of Little Norway. Photo: Mats Burström. The island that arose as a result of the interplay between human actions and natural forces was soon adopted for social activities. In the beginning of the 20th century a local society built an amphitheatre and a dance floor there. The dances were so popular that people joked about the risk that the island would fall apart. The island was also famous for its vegetation with many flowers that you do not normally find in the area. These are so called ballast plants that arrived to the island as seeds in the ballast and then managed to establish themselves in the new environment. Little Norway with waving flags. Photo: Lilian Vesterman. In connection with the one hundred anniversary of the peaceful dissolution of the Union between Sweden and Norway in 2005 there was a private initiative to donate Little Norway to Norway. The idea got a lot of media attention and both Swedish and Norwegian officials commented it positively. Two flagpoles were placed on the island where the Swedish and the Norwegian flag were raised next to each other. 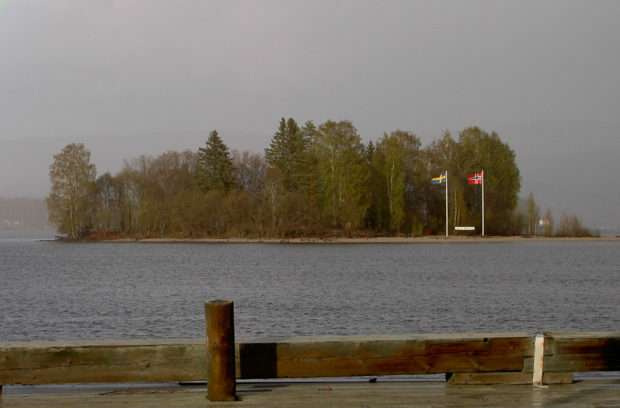 Between the flagpoles there was a sign announcing the island’s name. The anniversary passed, however, without any handing over of the island and in the end the idea came to nothing. The river’s water flow continues to bring more sand to Little Norway and the island is today surrounded by long sand reefs that changes form and position from time to time. This makes it quite difficult to reach the island and it is no longer such a good place for bathing as it used to be. To this adds the fact that a colony of cormorants has established themselves on the island. They have nests in almost every tree and their droppings kill the vegetation below and spread a rank smell. 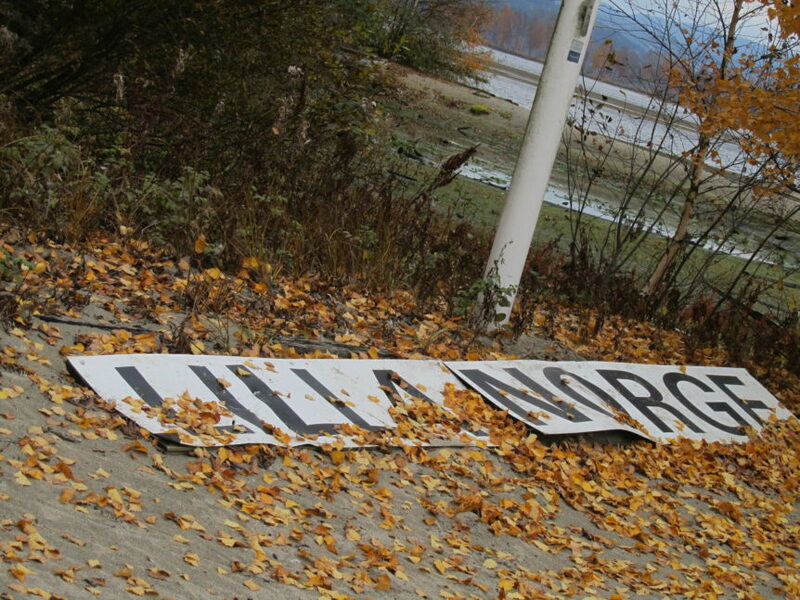 Now the nameplate has fallen to the ground and Little Norway is no longer as welcoming as it once was. The nameplate that used to stand between the flagpoles. Photo: Mats Burström.